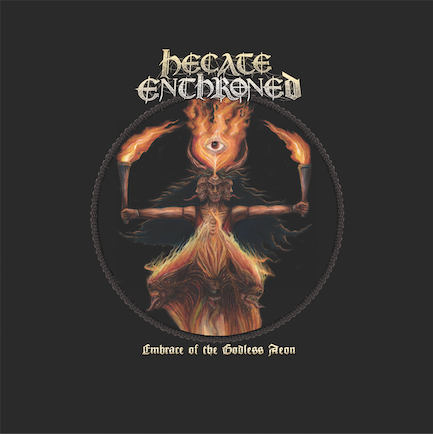 Los Angeles, CA – Friday (Jan. 25), the UK-based symphonic blackened death metal group HECATE ENTHRONED will release “Embrace Of The Godless Aeon,” their first album in five years (and their debut for new label partner M-Theory Audio). Today, the group unveils the second taste of the horrors that await – “Revelations In Autumn Flame,” which is now available on all streaming platforms. A music video for the song can be seen at this location – http://hecateenthroned.bandcamp.com/video. Portions of the clip were shot during the group’s recent performance at the Tabernacl Chapel in Llandundo, North Wales, which bassist Dylan Hughes says provided an epic setting in which to film. 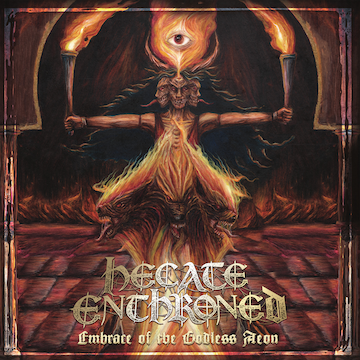 “Embrace Of The Godless Aeon” – which features cover artwork by Nestor Avalos (Bloodbath, Rotting Christ, The Black Dahlia Murder), as seen above – can be pre-ordered now on CD and red splatter vinyl at this location – www.hecateenthroned.bandcamp.com. A limited-edition deluxe box set that features a digipak CD of the new album plus the exclusive purple vinyl and cassette editions of the album, a signed photo card and other collectibles including a coaster/bottle opener, a poster, a woven logo patch, two stickers, pin and a different tarot card unique to each box is also available. Digital pre-orders on Bandcamp and other platforms include “Revelations In Autumn Flame” and “Temples That Breathe” as instant downloads.